THE DIVINE MOTHERHOOD OF MARY! By her divine Motherhood, the Blessed Virgin Mary possesses indisputable rights over Our Savior. On earth as in Heaven, Jesus pays His Mother the entire respect and tenderness of a Son. Mary’s divine Motherhood should inspire us with unlimited confidence in her all-powerful prayers for us. At the foot of the Cross, God entrusted Mary to us as our Mother. She holds the key which opens the Heart of Jesus that the flood of His richest Graces may pour out upon the world. It is Our Lady’s role to distribute the Graces merited by the Precious Blood of her Divine Son. She refuses them to no one! Christ died for all men. 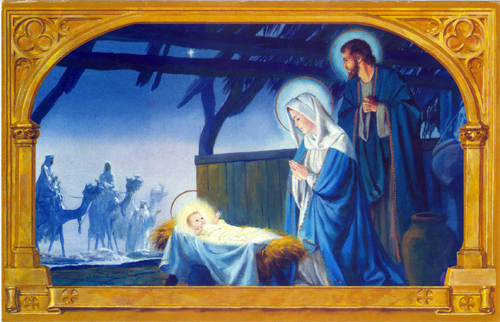 Mary saw Jesus born in a wretched stable. She was forced to flee into Egypt to guard her Precious Treasure from the murderous rage of Herod. She lost her Child in Jerusalem, finding Him only after three longs days of tears and agony. It was by suffering that Mary united herself to her dying Son for our deliverance at the Foot of the Cross. Her faith was unfailing, her confidence unshakable, and her love knew no bounds! Mary longs to open the door of our hearts so that Jesus might enter into them. In the Holy Eucharist, He communicates His infinite Life to increase the action of Sanctifying Grace within us. He causes His breath of Life to animate our hearts. He brings us His Precious Blood to quench the fires of concupiscence. 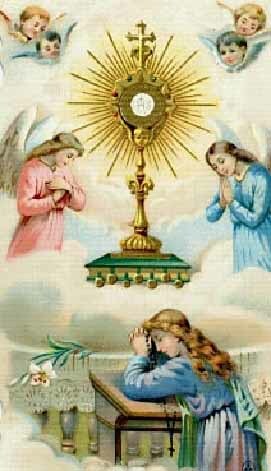 Here in the Eucharist is the Miracle of His Love: the very Bread of Angels! May the Humility of the Shepherds, the Faith of the Wise Men, the Joy of the Angels and the Peace of the Christ Child be God’s Gift to us and to all Men, this Christmas and Always! UNIQUE AND BEAUTIFUL CHRISTMAS GIFTS! The Holy Mass Crucifix: A sturdy pewter Crucifix dedicated to St. Philomena with St. Benedict Medal on the reverse. Receive the Infant King into your heart and give Him to the hearts of your family and friends! Enroll them in the Christmas Mass Bouquet: Thirty one days of Sacred Liturgies will be offered for all those who enroll in the Christmas Bouquet of Masses offered by Fr. Ivan Kolodiy and the good priests in Ukraine. Your spiritual and temporal needs, your family living and dead will be remembered at the Holy Altar every day during December. The Christmas Mass Bouquet will be crowned with a solemn High Mass on the Feast of the Nativity of Our Lord Jesus Christ and during the Christmas Octave. There could be no more precious gift you can give at Christmas time. We will mail the beautiful Mass cards directly to you. These may be sent along with your Christmas greeting cards or placed inside your gift packages. This is a wonderful way to keep Christ in Christmas!!! 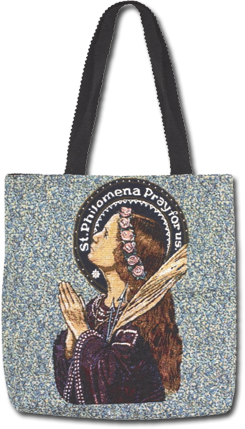 SUGGESTED STIPEND DONATION: $5.00 each for Enrollment in the Christmas Bouquet of thirty one days of Masses: PRINT VERY CLEARLY EACH NAME! Revolution, war, famine, atheism and persecution had trodden Europe hard during the eighteenth century. The icy Jansenist heresy had withered the spiritual vigor of Catholics. The only spirit that seemed to flourish was the spirit of self-sufficiency. Men were well content to believe in nothing but their own abilities. They talked about the Rights of Man, the right of any man to think as he wished. The nineteenth century dawned while nations fought for kingdoms and colonies, and men maneuvered for power. It was born coarse, boastful, lustful and pompous. Its good men were monuments to their own respectability. Its leaders truly believed they had stamped out superstition by putting priests to death and exiling Catholics. Its greatest man, Napoleon, who was said to have been as great as a man can be without virtue looked over the heads of his contemporaries and admitted that the best day of his life had been the day of his First Communion. But he spoke of it as a dream impossible to recall. To begin with, hard-trodden as Europe was by the forces of revolution and persecution, it was these very forces which, in another way, fertilized it for a spiritual harvest. Wherever martyr-blood is shed, a glorious harvest of new Christian life is brought forth. The 19th century dawned when Europe lay under a heavy dew of martyrdom. Three Bishops, 178 priests were put to death during the French Revolution, 32 nuns, the Martyrs of Orange, and many more. This chapter in Christendom is a very different one from the chapter in international history which deals with the same period. When we have duly admired administrative genius, we turn with an unconscious relaxing of our respectful expressions to smile at St. Madeleine-Sophie as she walks down the cloister of one of her convents followed by a cat and five kittens, or at St. John Bosco lost in a crowd of shouting boys. Yet, these were the geniuses: their work is still growing. They would never call it their work, but only work purposed and designed by the Eternal God for Whom they went on a few errands. Let us look at the portraits of our great-grandmothers and great-grandfathers, and remember that they were alive when St. Philomena began her miracles. I warn you that it is impossible to write soberly of Philomena. I have consulted some very old-fashioned books, but the more they tried to make her appear a saint of ordinary manners, and the more they appeared to be trying to dress her up in long words and stiff phrases, the more it was impossible not to smile. I won’t dress her up. I will let her actions speak for themselves, so if you are shocked, you will be faced with the ordeal of telling a canonized saint that you do not approve of her behavior. On May 25, the tiles were removed and the tomb opened. It contained some small, unbroken bones and a fractured skull. Embedded in the concrete which had closed the tomb, was a broken phial still containing a substance which, when tested, proved to be dried blood. Beyond question, this was the tomb of a martyr! The doctors and surgeons convened to give their opinion, stating that the relics were those of a girl not more than 14 years old. The archaeologists said that, from the position of the grave, its inscription and other indications, they were satisfied that it dated from not later than 160 A.D. and might be earlier still. In other words, the relics were those of a girl-martyr who had received the Faith from those who had known the Apostles. Then, according to the usual procedure, the relics were carefully sealed in a silk-lined wooden case, and taken to the Custodia Generale to be kept there until they should be given by Papal permission to some church or cathedral. These relics remained at the Custodia Generale for three years. In 1805, England was at war with France, who had been engaged with Ireland and Scotland, attempting to invade England. Napoleon, who had been the Commander-in-Chief of the French Army, was now Emperor. It was the year of Austerlitz and Trafalgar. 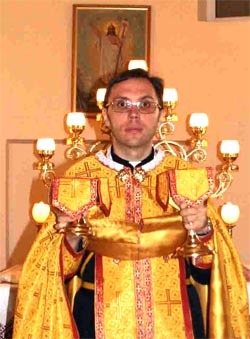 That summer, the Bishop-elect of Potenza went to Rome to be consecrated. He took with him as his Chaplain, a holy missionary priest who was serving the parish of Mugnano near Naples. This priest’s name was Don Francesco di Lucia. Don Francesco had a heavy heart. His parish was infected with revolutionary ideas, resentment against the authority of the Church, unbelief and immorality. His secret hope was to get the Bishop to use his authority to obtain for him the relics of a martyr – a saint who would come back with him and help him with his parish, which only a saint could convert. He knew exactly what he wanted: a virgin martyr whose name was known. Don Francesco went to visit the Guardian of the Custodia Generale who was impressed by this devout and humble priest. He would help him get what he wanted and told him to choose among the relics in the Custodia. Delighted, Don Francesco looked at the relics. 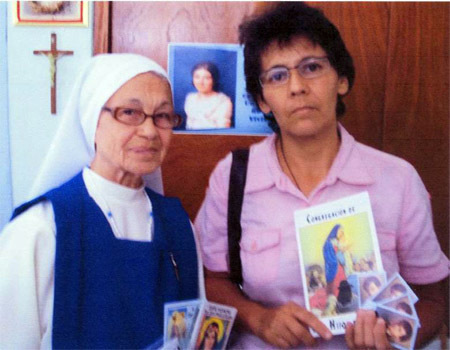 They were those of thirteen martyrs, but only the names of three were known: one was a child, one an adult, one was Filumena. He had wanted a virgin martyr from the first. 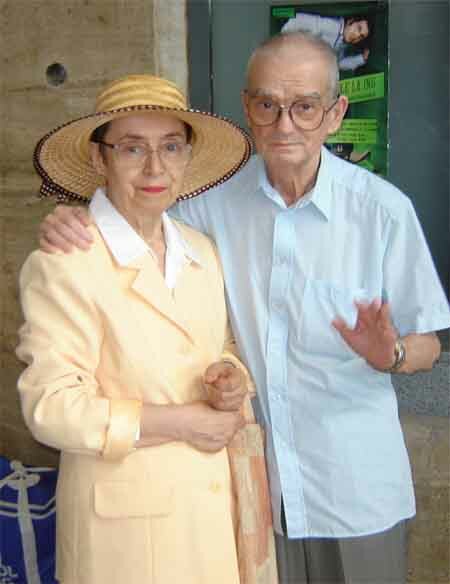 When he stood before the case containing Filumena’s relics, he was filled with spiritual joy and the heaviness of his heart was lifted as though she had instantly taken it from him. This was undoubtedly the helper he needed! The Guardian promised to arrange for him to have her. Imagine his disappointment, then, when the official reply came that bodies of martyrs whose names were known are so few and those found must be kept for special churches or dioceses. His sadness returned and redoubled. Rome is not the best place in which to spend the summer or, at least, it was not in those days when the marshes of the Campagna had not been drained. With overwork and worry, heat and disappointment, Don Francesco lost his sleep, his appetite and his health. A friend offered him the relics of another unnamed martyr to comfort him but he was determined that it was Philomena or nobody, who could and would convert his parish. One night, he found himself burning with fever. He solemnly promised Philomena that, if she would make him well, he would take her for his patron to Mugnano by hook or crook. His fever left him, he fell into a refreshing sleep, and awoke in the morning in perfect health. That decided it. Philomena wanted to come with him as much as he wanted to have her. This time, he went to the newly consecrated Bishop and asked him to use his influence. When the Bishop heard the story, he agreed that the little saint seemed to want to come to Mugnano. 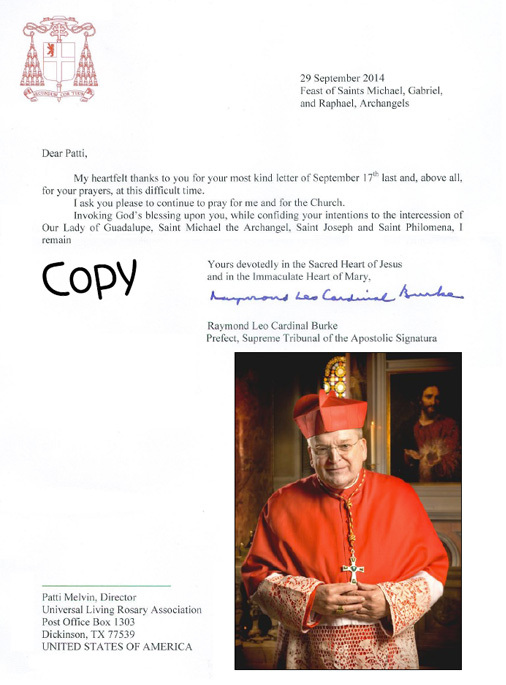 He added his request to Don Francesco’s, with the result that the Bishop could not be refused. The Guardian gladly acted on the permission he received to hand over the relics, saying that he felt sure Philomena wished to go to Mugnano and work her miracles there. One wonders what grounds he had for saying that! Had he gotten to know her during the three years she was in his care? Joyfully, the good Bishop and Don Francesco took possession of the precious casket. Determined to bring Philomena to Naples with many prayers and every honor, the casket was to be put in the front of the episcopal carriage. That was the beginning. Philomena had given two gentle little signs that she wanted to come to Mugnano. It was as though she showed signs of being awake after her sleep of seventeen and a half centuries. After so long a time in Paradise, she was ready to come back to work in this troublesome world. But remember, she was not the young mistress of a household like St. Cecilia; she was only a girl of thirteen. St. Paul tells us: “Whether you eat or drink or do anything, do all for the glory of God.” (1 Cor.10:31) In a servant of Mary, everything should be holy, even the partaking of food. With what holy sentiments must not Mary have taken Her meals in the company of Her Divine Son and good St. Joseph! At every meal, let us practice some slight mortification for love of Mary. God, in His Love for us, wishes us to relax, at times, from our labors. But, how often are not God and our neighbor offended in even lawful forms of amusements! A true servant of Mary will also think of Mary during his recreations. He will guard well his eyes and his tongue that sin may not enter through unrestrained senses. What love, what goodness and what modesty did not Mary manifest in Her conversations! Imitate this beautiful model! When possible, try to introduce a few words about the Blessed Virgin into your conversation. Try, when the clock strikes the hour, to pray a Hail Mary devoutly, mindful of the words of St. Alphonsus that a devout Hail Mary is of more value than the whole world; and resolve to conform yourself to the sentiments of the Immaculate Heart of Mary during the coming hour. Accustom yourself, as the Saints did, frequently to pronounce the holy name of Mary, that name which reminds us of so good a Mother who is the merciful dispensatrix of God’s treasures, the strength, the sweetness and the life of our soul! Imitate the devout servants of the Blessed Virgin in greeting the images of Mary; for, to greet Mary is to greet Jesus. “Hail to thee, O Mary!” Saint Bernard would say when passing a statue of the Blessed Virgin. And, at one time, he heard the voice of Mary responding, “Hail, Bernard!” Give the picture of Our Blessed Mother a prominent place in your home. Having begun the day with Mary, conclude it also with Her. Through Mary, offer your evening prayers to God. In union with Her, recite the Acts of Faith, Hope and Charity; beg of Her, as the Refuge of Sinners, the Grace of a heartfelt sorrow for all your sins, fervently pray Her Litany and ask Mary once more to give you Her blessing. Blessed be the holy and Immaculate Conception of the most Blessed Virgin Mary, Mother of God. O Mary, help me to live in God, with God and for God! Offer your sleep in honor of Mary’s, whose sweet communication with God was never interrupted, even while She slept. Commend your soul to Mary, as if you were to die that night. Say a word to your patron Saint, and a Hail Mary in honor of your Guardian Angel that he may keep you from all illusion of evil spirits. How beautiful and precious is this life of union with Mary! What an abundant harvest for the great day of reward! What glory for Mary and Her Divine Son, what joy for the angels, and what happiness even here below for a soul who applies herself to live in conformity with the sentiments of the Heart of Mary! At the hour of death, you will bless every day thus spent in union with Mary. 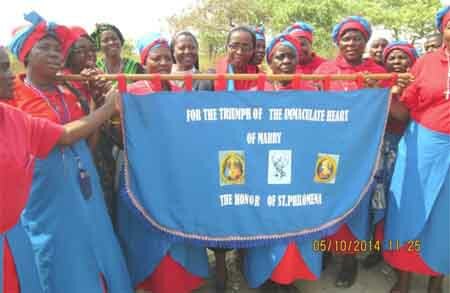 Yes, happy are those souls who practice True Devotion to Mary and receive Her choicest favors. For them, Mary is a Mother, model, guide and protectress. They call upon Her and cling to Her as a little child does to its mother, and never take a step unless holding Her hand or commence a prayer or perform a work without interiorly approaching Mary. The holy Heart of Mary is their oratory. Their prayers, labors and trials offered in this sanctuary of Grace give immense pleasure to the Most Holy Trinity and win for themselves ineffable treasures of Grace. I have received all the Sacramentals and materials you sent. 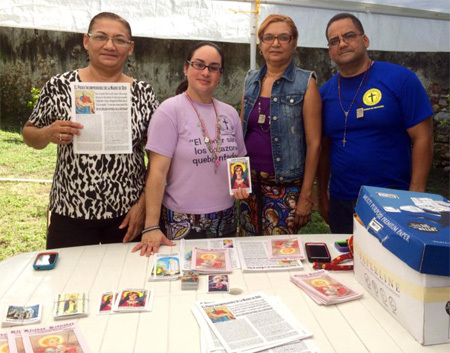 These have been blessed and distributed, and received with joy by the faithful in the Diocese in Puerto Rico. On 9th October, we met with the Superintendent of the Catholic Schools in Arecibo Diocese, Mr. Juan Valdas, with the idea of presenting the ULRA and the Congregation of the Children of Mary to motivate teachers, children, youth and their families to imitate St. Philomena, St. Therese and St. Dominic Savior as role models for the youth. Mr. Valdas invited us to make a presentation at the meeting of 14 Catholic schools of the Diocese in the month of December. May you be blessed in the Names of Jesus and Mary! I am profoundly grateful to you for your tender concern and follow ups whenever I am on mission. You boost and light up our glorious work! This mission has taken four months! The first time for me to take such a long duration in the history of my travels! Dear glorious Mary has followed all our steps to spectacular success. 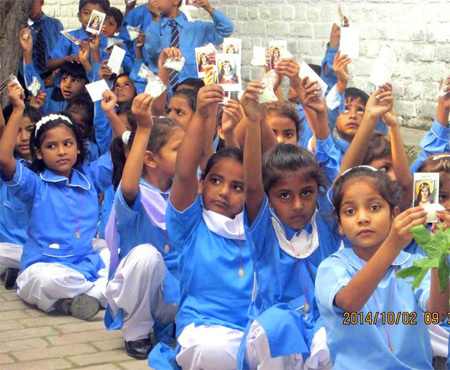 I have reached many souls and created awareness of her work, and it has helped us to harvest many new members! Transport remains a major hurdle! First on agenda, when I immediately arrived into South Sudan, the world’s youngest nation, I was to oversee two successful Sacramental deliveries to two dangerous hot spots: (1) Malakal diocese – vast region and epicenter of the renewed conflict where human life has been jeopardized by unpublicized genocide since mid-December, 2013. (2) Another lift went to the commanding officer in the disputed Abyei region where Islamists and South Sudan soldiers fight a war shadowed by unsettled border demarcation disputes! Your powerful prayers have propelled my visits more than ever before. I met with different types of anxious people and enthusiastic audiences ready to learn: Visited village homes, clinics and schools in addition to Catholic churches and chapels! 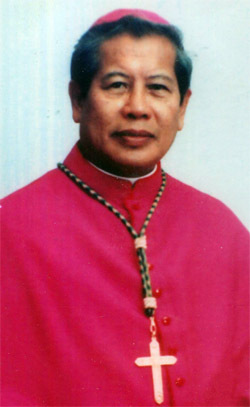 The Rosary is the central emphasis of the intensive lessons preached. 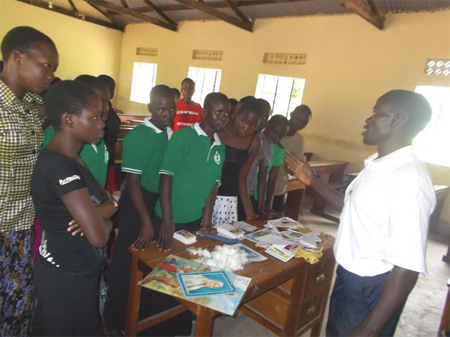 The Youth for Purity groups launched last year have multiplied and are now expanded to cover three dioceses. I encouraged for more! 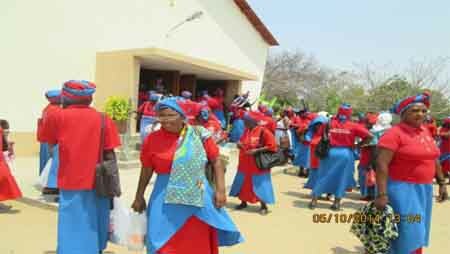 Immodesty in dress and mind, prostitution, idleness, drugs, abortions, devil worship, disease (AIDS) and polygamy are the main vices they fight! I met with elderly Msgr. 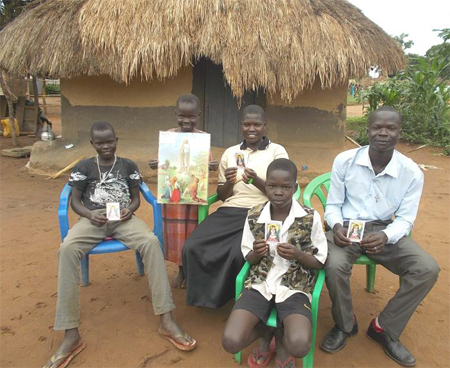 Erkolano Lodu Tombe of Yei. 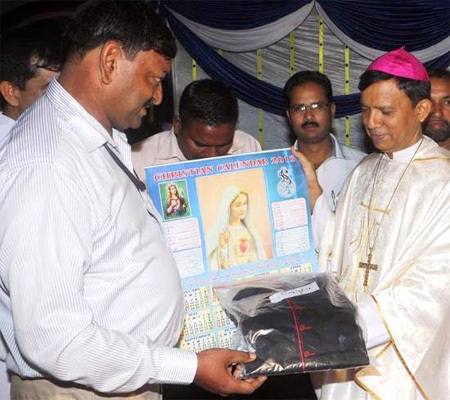 He poured enormous blessings to ULRA work with wishes for multiplied rosary missionary zeal; to curb the evil disunity forces out his diocese. 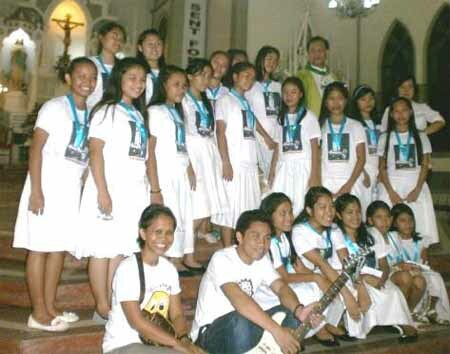 I met with a group of Catechists from the Holy Family Parish and through them folds of people flocked to hear my talk. 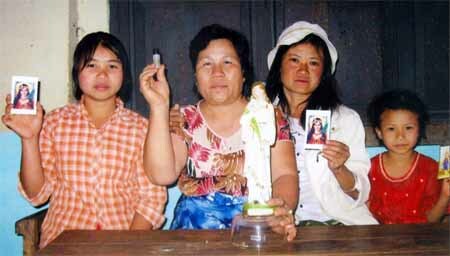 We discovered that over half the population is still Catholic but no one knew about the Rosary! 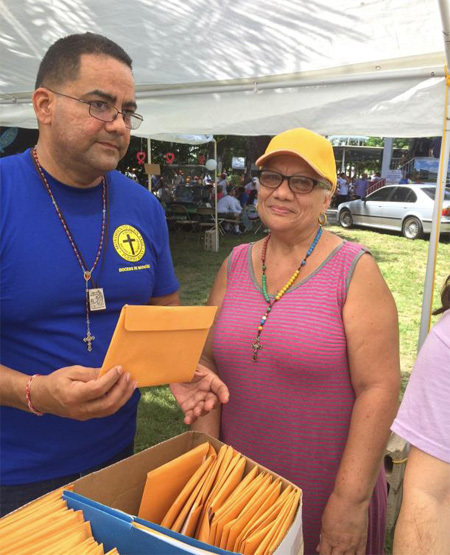 I distributed close to 1,000 Rosaries to Catholics and interested Protestants; The Miraculous Medals were given to everyone! The Main question is when shall we reach them all to guide and protect every South Sudanese from the evils that trounce their new nation? 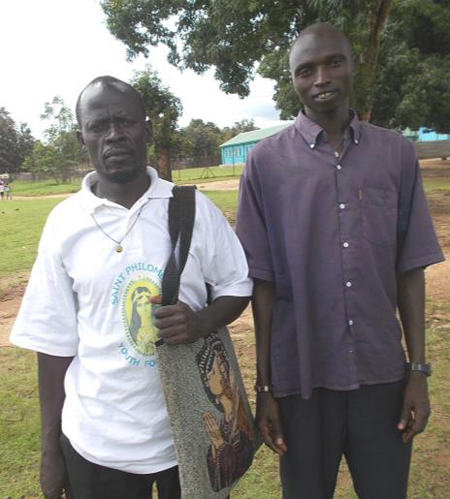 I am thankful once again, for your passionate love towards me and the poor South Sudanese! 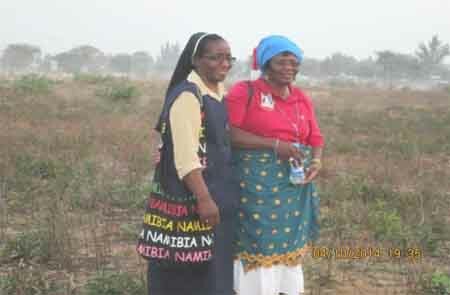 Real missionary work is in Sudan! 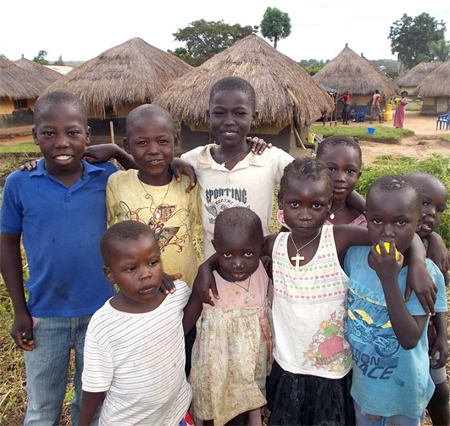 I beseech each of our benefactors, not to get tired of our requests for help to South Sudan where urgent help is needed to assist our poor brethren that have spent their lifetime fighting forced Islamization. 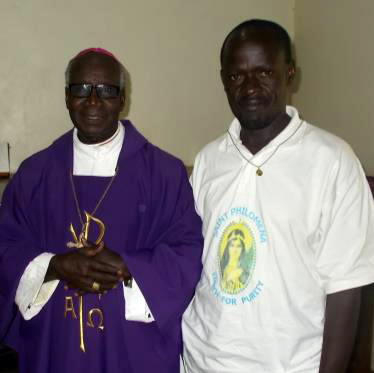 Please join us in praying for peace in the Malakal diocese. 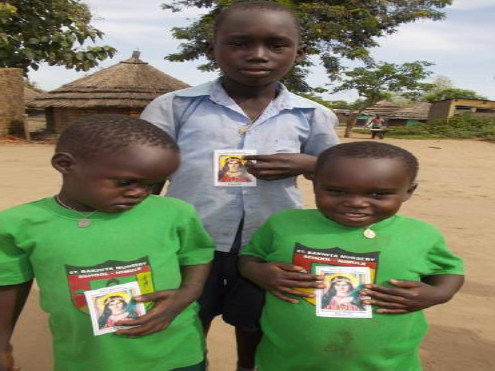 They need our support, not with foods but more Sacramental help to protect in deteriorating camp lives! Angela in Darfur has lost her high hopes for any lifts. Severio in Dungu, Arafa is in the furnace of Libya! All of them would be so happy for any trace of Sacramental Christmas Gifts. Though it is still impossible, we continue to pray over it! Thank you so much for your endless prayers to the Souls in Purgatory, most especially those who have innocently perished from human greed for power! Talks have helped some to understand the treasure of suffering! May you please tell all the benefactors that they have not escaped the unified prayers of the suffering Sudanese since I came here! 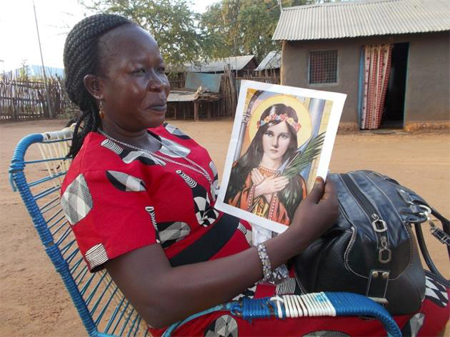 Our Lady of the Miraculous Medal, convert us, South Sudanese! Our Lady, Consoler of the Afflicted, pray for us! 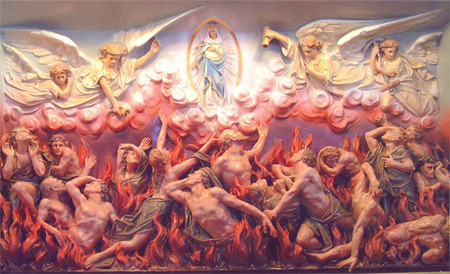 This is the solemn month of remembering our departed Loved Ones who await union with God in the purifying fires of Purgatory. 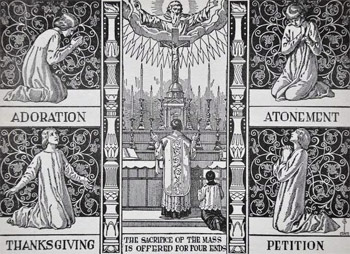 Your suffrages for them and the thirty days of Sacred Masses being offered by us, will hasten the day of their union with God in Eternal Beatitude. There is no greater charity. Christ is the world’s greatest Teacher. He spoke unforgettable parables and confounded the sinfully wise in their wickedness. Still, it is not uncommon for each of us to go through spells when He seems silent to us. We listen for His voice and hear nothing. In His silence, He is speaking to us. We must listen. In the Gospel at Holy Mass, He speaks to us; through the voice of our superiors, through our Daily Duty, through the wise guidance of a spiritual book: all these are God’s voice speaking to us that we may find Truth and have direction. The Son of God walks with us today, but we cannot see His Face. He comes from the secret streets of Heaven, but hides Himself in the Host, in the Tabernacle and in our hearts. It was sin that forced His divinity into hiding. Yet, even in hiding, God is constantly revealing Himself to us. He is in the works He created, the beauty of the flowers and in the mighty strength of the atom. His tender love shines in a mother’s eyes, His generosity shows in the lavishness of nature. Although God may seem to sleep, He is steering the ship hidden by the storms and waves. The earth is potent with grain and wheat, but it must be dug and plowed. Greetings in the Lord! This letter is very much overdue. I apologize for the delay of my response to your kind letter last July. 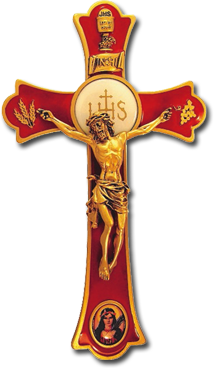 I thank you very sincerely for the Holy Mass Crucifix you sent me. I feel very privileged to have been gifted with such a very vivid “reminder of the reality of Calvary present to all time and place in the Holy Mass.” Thank you also for reminding me of my assigned Decade given to me years ago by Sister Lily Ann Ayu-on, DST, who enrolled me in the Universal Living Rosary Association. Sister Lily Ann had died some two or three years ago. God rest her soul. 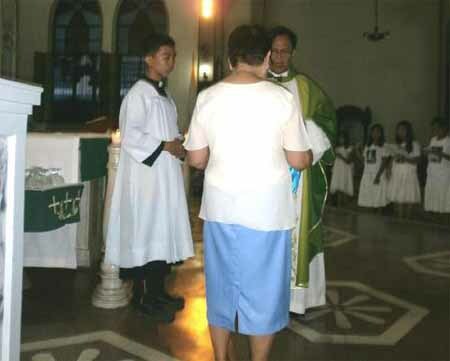 She was in charge of the Catechetical Apostolate of the Diocese of Naval, and she also enrolled in the association some of the catechists of the diocese. You mentioned in your letter whether there is anything we need for the Association. Yes, we need Sacramentals, Rosaries and some religious articles which some prospective members are asking. I remember Sister Lily Ann used to give some of those to members when she organized the Living Rosary Association in Naval. Thank you very much, Patti, for your kind letter. I appreciate the last two paragraphs which are very beautiful reflections on Our Lady and the Holy Rosary. Incidentally, Our Lady of the Holy Rosary is the Patroness of the Diocese of Naval. The word “NAVAL” is reminiscent of the Naval Battle of Lepanto. We pray to Our Lady to once again defeat the evil intentions of the enemies that are persecuting Christians in some parts of the world. 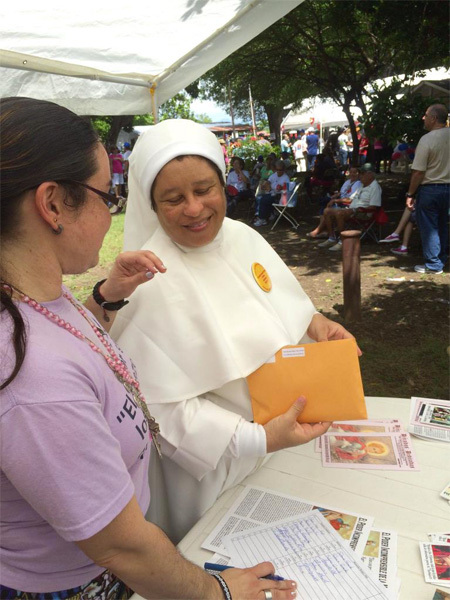 Please, pray also for me as I do for you and your work for the Universal Living Rosary Association around the world. God bless you abundantly! I am an inmate in a federal prison. My name is Matthew Rogers and I am 34 years old. A year and a half ago, I was in the county jail and facing a US attorney who wanted me to serve 20 years plus. I prayed the Rosary daily and petitioned the Saints, went to Confession often and attended Holy Mass whenever the opportunity arose. Even through extreme darkness, the light was always Mary’s most pure and loving Heart. Our Lady was always with me. I had a vision once during a long cold night in the dungeons cell. She appeared in my mind as a self-luminous beacon in the dark. The light of God shone through her. It was like She was a candle in God’s Hands. She wore royal blue and her hair was brown. She looked youthful and filled with perfect peace. I am Mary’s child and She does not abandon her own. I admire what the Living Rosary does in helping the world to recognize Mary as the gift that She truly is. 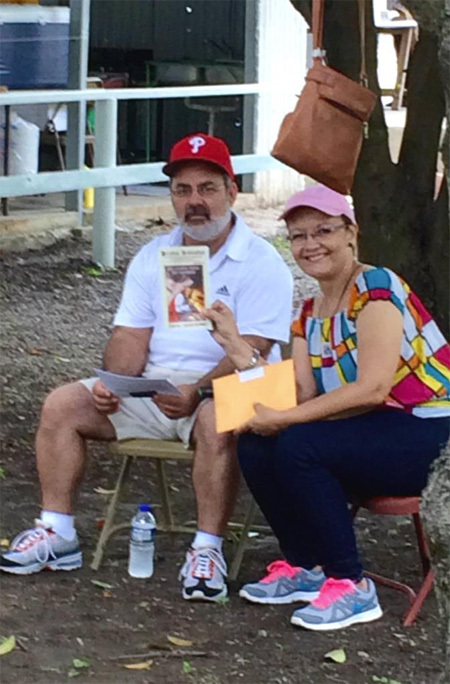 A week ago, I helped a man learn to pray the Rosary using the Rosary leaflet put out by the Living Rosary. 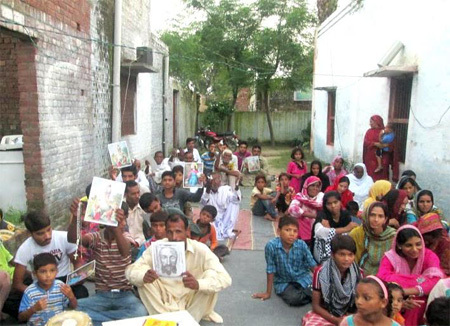 It isn’t the first time I have used your materials to teach a person about the true Faith. To me, nothing I have done in my life is more important than this. My locker is adorned with prints and icons that you sent to the prison; prayer cards and other images fill my living space. Most inmates hang dirty pictures of naked women in their lockers but, for me, the ever Virgin Mother of God is far more beautiful. There is such little purity in this hell-like prison. In such darkness and filth, Mary’s perfect Heart lights the way! When federal prisoners receive their sentencing, none of their property goes with them. All my Catholic books, Rosary, Crucifix, medals and all that brought me comfort were stripped from me. Yet, even then, I did not give up hope. Sitting in a solitary confinement cell for four days straight, I fashioned a Rosary out of toilet paper and meditated on the Mysteries. There are times when this experience hurts so much, yet if I turn and unite my suffering with His Cross, I can bear anything! I ask a few favors: a Rosary, prayer book, little holy card and a prayer leaflet. I ask you please to try and remember to pray for all prisoners, homeless and suffering people, for all those who fall asleep alone and unwanted, the lonesome, the afraid and the sick. This I beg of you. Love humanity as Mary does. See even your enemy through Mary’s eyes. May we be united with her pure Heart in Heaven! Tangible goodness is so precious and so rare in prison. 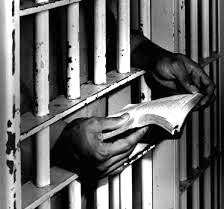 The inmates who see me “being Catholic” really start to wonder, in good ways, what it is all about. So many people are missing the freedom that faithful obedience offers. I am trying my best to help. The Brown Scapular marks the militia of the Immaculate One. 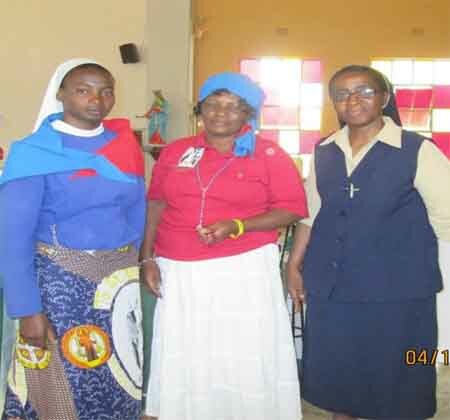 Before God’s holy angels, it designates those who wear it as servants and slaves of Creation’s Queen, as specially beloved sons and daughters of the sun-robed Virgin who has crushed the serpent’s head. To serve the Mother of God is the highest privilege and, truly, our pledge of eternal peace. The Brown Scapular is the being the garment of Mary Immaculate and, as such, it is a constant call to modesty in dress and conduct; a silent protest against present-¬day permissiveness and a hidden appeal to reparation for the insolent nakedness of proud neo-paganism! The Brown Scapular is much like a miniature hairshirt and a mild reminder of the need for constant mortification. Our conflict today is not for land or national rights, it is for the souls of men; a conflict between the absolute who is God-man, and the absolute who is man-god: God who became man vs. man who has made himself God! The religion of the man-god is a new religion without a Cross, a liturgy without a world to come, a religion to destroy all religion. The forces of evil are united; the forces of good are divided. We cannot unite at the cost of TRUTH, but what is needed is a unity of prayer. We may not be able to meet in the same pew ~ would to God that we could ~ but we can meet on our knees! To a faithless deadlocked world, Our Blessed Mother comes offering us a choice: DEATH IN LIFE, OR LIFE AFTER DEATH! Our exterior life with its actions should more and more resemble that of the Holy Family at Nazareth. Our Lord once said to St. Gertrude: “Just as a usurer never willingly loses a chance to gain some profit, much less would I permit even one of your thoughts, one of your slightest movements prompted by love for Me, to be without profit for your soul. 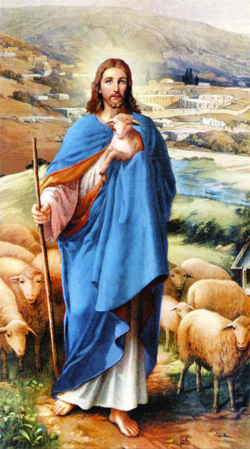 I will make all this redound to My great glory, and your eternal salvation.” All our actions, even the most common, done in the state of Grace and with a supernatural intention, are of immense value in the Eyes of God, and the merit increases in proportion to the purity of the motive that inspires them. Place, then, every morning, all your actions in Mary’s hands, and renew this offering frequently during the day. This good Mother will purify them, says St. Louis de Montfort, from every stain of self-love and every unconscious attachment to creatures, which glide even into our best actions. Mary will beautify them and adorn them with Her own virtues and merits. By giving up our own intentions and by submitting them to the wish and will of the Blessed Virgin, we follow the example of Jesus Christ Who wished to be dependent on His most Blessed Mother. We thereby glorify God and share in Her sublime intentions which were so pure that the very least of Her actions gave more glory to God than the most heroic virtues of the greatest Saints. Let us imitate this beautiful model: in our labors, leisure, studies and trials. In a word, in all things, let us be dependent on Mary and put everything into Her hands. ALL THROUGH MARY, FOR JESUS! Oh, what joy for the angels, what glory for God, what favors for ourselves and for others we shall daily procure by this simple practice! 1. Study: Mary is the seat of wisdom and the source of Divine Light. If we wish to succeed in our labors and studies, we must have recourse to this august Mistress. St. Louis Grignion de Montfort wrote to his brother, Joseph, that he would be one of the best in his class if he confided his studies to his tender Mother, the Blessed Virgin, and continued to serve Her, for She would obtain for him whatever he needed. 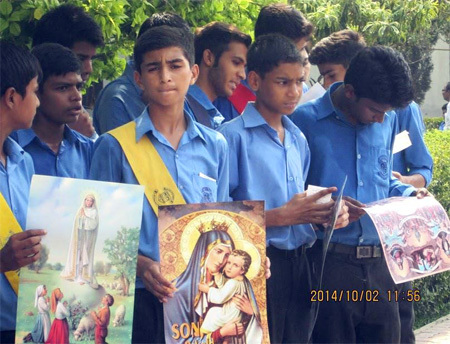 O student of Mary, especially you who study for the priesthood, imitate the Saints. Before beginning to study, kneel down and say a Hail Mary to this radiant Star; She will banish the darkness of your intellect and give rest to your heart. At the close of your mental labors, place them again in Her hands, with the petition to let them redound to the honor of Her Divine Son. 2. Manual Labor: How pleasing to God was Mary’s work! “Even as an infant in Her cradle,” says Christopher de Vega, “Mary honored God more than St. Lawrence roasting on the gridiron, because She was inflamed with greater love. 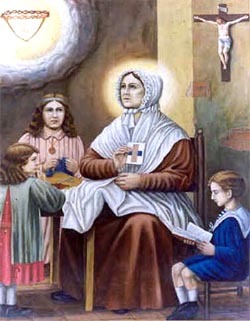 This lovely Child gave more glory to God by Her infantile actions than the greatest Saints have given Him by their heroic deeds.” And what can be said of Her works in later life! If, then, we want to give great joy to God and to His Angels, we must place our manual labors in Mary’s hands, if only by a simple act of the will. Enroll your Departed Loved Ones in thirty days of Requiem Masses in Ukraine. Fr. 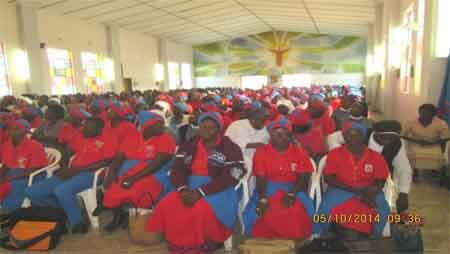 Ivan Kolodiy has arranged for these Masses to be offered from 1st to 30th November. The names you send will be placed upon the Altar during this time. A Mass card will be sent out to you for each one you enroll. SUGGESTED STIPEND DONATION: $5.00 each for Enrollment in the NOVEMBER Bouquet of thirty days of Requiem Masses for your departed Loved Ones: PRINT VERY CLEARLY EACH NAME! A SHORT TIME LONGER, AND THEN ETERNITY! “Even though I am on the other side of Eternity, please do not think for a moment that I am loving you any less than I have loved you on earth. On this side of the Gate, there are no more tears, no more sorrows, no more separations, but only pure infinite joy, peace and … love which is so unfathomable that, on earth, not even a glimpse of it can be imagined. I have seen the Face of God, the Faces of Jesus and Mary, and beheld the Beatific Vision … Eye hath not seen, nor ear heard, nor can it enter into the mind of man what God has in store for those who love Him and are willing for the brief moment of life on earth to prove their love for Him by resignation, abandonment and trust in all the sufferings, separations, disappointment, trials and frustrations that befall them. God allows those He loves to undergo these trials that they may be purified in preparation for their entrance into Eternity, into the presence of Almighty God Himself, His Angels and Saints, and the Beatific Vision which surpasses all human comprehension. I want to let you know how proud I am of your perseverance over the years that I sadly had to leave you alone by God’s ordained Plan. You have suffered much from loneliness and have been afflicted by many crosses and frustrations; yet, you turned to Jesus and Mary asking them for the Grace needed to carry on. As you struggle up that last bend in the road towards Calvary, you will be offered the opportunity to become one with the suffering Christ, nailed to His Cross of bitter pain, abandonment and humiliation. Over all these years, I have been lovingly watching over you, praying for you, and asking Our Lady to send special Angels down to protect you. I miss having you by my side, but only for a short time longer. There is so much evil and sin in the world today. God has confidence in your love for Him and is keeping you in the world a little longer. He has need of your sufferings united with His in reparation to the Father for the conversion of sinners and the sanctification of the just. Your heart would literally die of joy if only you knew how very much you are loved by God and how much my love for you has grown, now that it is united with the pure Love of God and His Holy Mother. He must keep all this veiled and hidden for now, so that your merit won’t be lost and His glory will be won. Second, the Mass is not about you. It is not about having a wonderful “weekend experience,” as one new parish based program claims. Nor is its purpose to make you feel good about yourself, to encourage you, to inspire you, or to make you feel included and welcomed. You simply aren’t the audience – God is, and the Mass is all about Him. 1. ADORATION: The Holy Mass is first and foremost an act of loving adoration. It is worship of God our Father. Why? Because He deserves it! Almighty God is the most perfect of all Beings, the self-existing one, and all that exists owes its existence to Him. He is the Supreme Good, the Good from which all other goods receive their meaning. He is the Supreme Beauty, the sole standard by which we can recognize and understand that which is beautiful. And He is Love itself, giving of Himself from all eternity. He alone is worthy of our awe-struck adoration. “Worthy art Thou, Our Lord and God, to receive glory and honor and power, for Thou didst create all things, and by Thy Will they existed and were created,” the Saints and Angels cry in the Book of Revelation, and the Mass is participation in this heavenly worship. 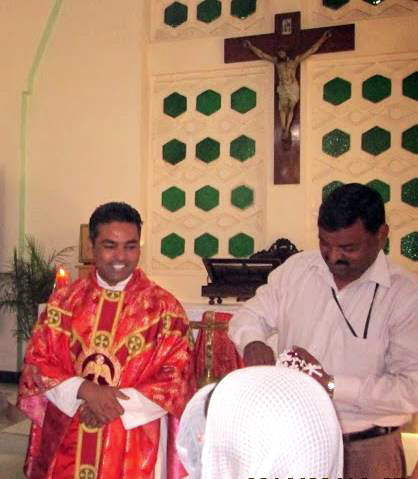 That is exactly what Holy Mass should be – an experience of happiness doubled by wonder. 3. ATONEMENT: We are all sinners and, while we do our best to rationalize and minimize it, all sin is a grave offense against God, incurring His just wrath. But, while we all deserve hell, we are not without hope. On the Cross, Jesus Christ atoned for our sins totally and completely, and we have the assurance that, if we turn to Him in repentance and faith, we can find forgiveness and healing. 4. PETITION: The Mass is a powerful form of prayer. In fact, it is the most powerful prayer the Church possesses. St. Jerome once said, “Without doubt, the Lord grants all the favors which are asked of Him in Mass, provided they be fitting for us.” Many of the Saints tell us that bringing our requests before Our Lord after the Consecration is one of the most effective ways to obtain all that we need spiritually and physically. I would encourage you to pray in this way, knowing that Jesus is on the Altar interceding for you as well. O holy Angel at my side, go to church for me. Kneel in my place, at Holy Mass where I desire to be. My Jesus hidden in the Host, come down from Heaven above. That Jesus’ Blood may cleanse all hearts, and suff’ring souls relieve. Besides the interior practices of this devotion which we have just described, there are also certain exterior practices which we should neither omit nor neglect. The first practice, which we have mentioned previously, is that, on some special festival of the year (the most beautiful day for it is the feast of the Annunciation), we offer and consecrate ourselves to Jesus Christ through the hands of Mary, to whom we give ourselves entirely. On that same day, we should receive Holy Communion for this intention and devote the day to prayer. This Act of Consecration should be renewed at least once a year. The second practice is to pay to the Blessed Virgin, on that same day, some little tribute as a token of our servitude and total dependence. This tribute may be either a mortification, alms or some prayers. But, the little we do give to Mary, we should offer Her with a humble and grateful heart. The third practice is to celebrate every year, with special devotion, the feast of the Annunciation, which is the patronal feast of this devotion. On this day, we honor and imitate that astounding dependence in which the Eternal Word placed Himself for love of us. The fourth practice is to recite often with special devotion the MAGNIFICAT, which is the only hymn of praise we have from Mary, in order to thank God for the benefits He bestowed upon us and upon the Blessed Virgin, and to obtain from Him new favors. We should not fail to say the MAGNIFICAT after Holy Communion, as the Blessed Virgin, according to the testimony of the learned Gerson, often recited it herself, particularly after Holy Communion. The fifth practice is to say devoutly the Hail Mary and the Rosary. The faithful servants of Jesus and Mary should love to recite this prayer often; neither its value and merit, nor its excellence and necessity are sufficiently known. The Hail Mary is a heavenly dew which waters the soul and renders it fruitful in all virtues. A soul that is not refreshed and watered by this heavenly dew brings forth only briars and thorns. Elect souls, slaves of Jesus and Mary, know that, after the Our Father, the Hail Mary is the most beautiful of all prayers. It is the most perfect tribute you can pay to Mary, because it is the greeting which the Most High sent Her by an Archangel to win Her Heart and which so affected Her with its mysterious charms that Mary, despite Her deep humility, gave Her consent to the incarnation of the Divine Word. By this greeting and homage, you will infallibly win Her Heart, if you pray the Hail Mary in the proper manner. I, therefore, beg you most earnestly, says St. Louis Grignion de Montfort, to pray the Rosary daily. At the hour of death, you will bless the day and the hour you followed my advice. Besides, try to say the Hail Mary often, with angelical devotion to honor Mary’s purity. With heartfelt gratitude, I thank you very much for the small box of Sacramentals, St. Philomena holy oil and cord, and other spiritual materials. The children are very happy and thankful. 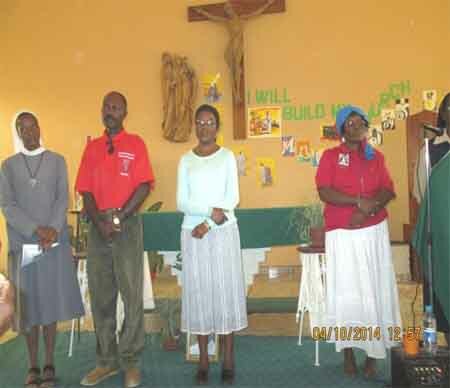 Their parents and Catechists are also very thankful. 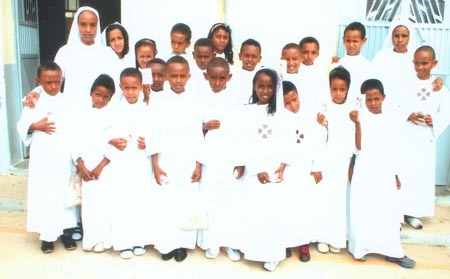 Here are the pictures of the children on the day of their First Communion. God bless you! What true joy is mine to thank you for your great generosity in helping with the roof which had collapsed on our parish church! I and all my parishioners want to extend to you the promise of our fervent prayers for many years to come. You and your intentions will always be our priority in prayer. Ours is a perilous time of revolution and your help is a healing balm for the Greek-Catholic Church in Ukraine. St. John the Baptist Church is located between two high schools and a kindergarten. Every day, the children come to the church to visit Jesus in the Most Blessed Sacrament and to ask God’s blessings for themselves and their families. The economic situation in Ukraine is very bad; yet, while we have few luxuries, we are rich spiritually! Material things perish in the wind, but Eternal Treasures are incorruptible.Christ was not content to offer His Life only once for those He loved; He wished to carry His immolation to a never-heard-excess: to immolate Himself at all hours of the day and night, and in all places upon the earth. Immolation is the fundamental state of Jesus in the Holy Eucharist. In the Eucharist, God is helpless, humiliated and annihilated. He is totally dependent upon man. If no one takes Him to the sick, He cannot go. If He is not safeguarded, He will be exposed to any sacrilegious outrage. What excess of Love! In the Eucharist, Christ has taught souls to flee from all pleasures which debase and stain, to embrace all sacrifices that purify and ennoble, and to shrink from nothing that serves love of God and love of neighbor. When Our Lord comes to us in Holy Communion, His Heart actually beats in ours; our heart and His are united! We are surrounded and enveloped on all sides by His Love; He in me, and I in Him. Love all for His sake: sinners, pagans, infidels, heretics, all who do not know Him and do not love Him. Plead earnestly with His Heart that all will be given a love for the wounded Heart of Christ and His crucified Church. May we never miss an opportunity to visit Christ in the Blessed Sacrament, to love Him, to thank Him, to petition and adore Him, Who waits all hours of the day and night for our visit! Dear Benefactors, we appreciate so much your concern for our needs. We beg God to give you strong health and abundant spiritual blessings which will not perish. Our children have fallen away from the Sacraments. Many are not married in the Church, daily prayer life has been abandoned. When we suggest they get their lives right with God, they no longer visit, call or write to us. We can talk to them about the Sacraments and the fullness of Truth but, if we are not living a vibrant and radical Catholic life, our words have little influence. If our relationship with God is truly the most important part of our lives, why is this not reflected in our lives? If our marriages and families are our greatest blessings, why do we not sacrifice our careers for them? If God has a plan for us, why do we make so many plans without Him! If Catholicism is true, why isn’t everything we do ordered around this Truth? Saints are beacons of Christ to the world. They are the most tangible fruits of the Sacraments. A saint is a powerful weapon in this culture of war. They are compelling in every Age and from every angle. They need few words to be understood: no defense, no money, glory or fame. They have only to be themselves and the world can’t help but to change for the better. Children learn more by what they see their parents do than by any words that may be spoken. We have fallen in love with knowing we are right and calling it love for our neighbor! We attack all the symptoms without getting to the heart. Let us not lecture them to attend Mass but inspire them to want to go. Do not tell them how to dress, give them the example and something to dress for. Instead of lecturing about Truth, live a life transformed by Truth. Prepare the way and, then, get out of the way! Open the door to Truth and then let Truth speak for itself. We must make radical changes in our lives if we are to change the lives of others. Saints are compelling. Empty words and prideful lectures are not! Each of us has been called to be a saint! If we are what we should be, the entire world would be set ablaze with love for God! This devotion, faithfully practiced, produces many wonderful effects in the soul. It establishes in us the life of Mary, so that we can truly say that Mary’s soul lives in us. The soul of Mary becomes, as it were, our soul. When Mary, by an inexpressible but real Grace becomes the Queen of our soul, what marvels does She not accomplish therein! Mary is the Co-operatrix of the great miracles which take place in our interior. She works there in secret, for were the soul to know and realize, it might only impair the beauty of Mary’s work and expose us to the danger of vanity. Mary is the ever faithful Virgin; She brings to the soul She enters, purity of heart and body, purity of intention, and fruitfulness in good works. Do not think that Mary, the most fruitful of all pure creatures, who brought forth a God-Man, remains idle in a soul adorned with Sanctifying Grace. She will make our soul live for Jesus Christ and Jesus Christ live in us. “My dear children, with whom I am in labor again, until Christ is formed in you” (Gal. 4: 19), said St. Paul regarding the souls he gained for Christ by his love, solicitude and labors. The same may be said, but in a truer sense of Mary. Jesus is as much the Fruit of Mary for each individual soul and for the whole world in general. He is Her Fruit and Masterpiece especially for the soul in which She, the most Blessed Virgin, dwells. In fine, Mary does all She can for such a soul in order that Jesus may be glorified; She enlightens the mind by Her pure faith; She deepens the heart by Her humility, She inflames it by Her love; She purifies it by Her maternal care. But where shall I stop? Experience alone can teach the marvels of Mary: marvels beyond the belief of the wise and the proud, and even of the majority of devout souls. As by Mary, God came into the world the first time in humiliation and abasement; may we not also believe that it is, by Mary, that God will come the second time, to reign over all men and to judge the living and the dead? We may certainly believe that toward the end of time and, perhaps, sooner than we think, God will raise up great men filled with the Holy Spirit and entirely devoted to the service of Mary. By them, this great Queen will work wonders in the world, in order to destroy sin and to establish the Kingdom of Jesus Christ, Her Son, upon the ruins of the kingdom of this corrupt world. By means of this devotion to the most Blessed Virgin, of which I give but the outline, these holy men will accomplish great things. Thank you, dear Patti and all ULRA, for your prayers. Now, I can walk again. Thank you, St. PHILOMENA, for helping and changing my mind. We love you very much. Thank you, JESUS and Mary, for the time you have given for me to better prepare my soul before before I come in front of YOU! GLORY TO YOU!!! This is one of the wonderful interventions of St. Philomena for us, the sinners in East. Thank you, St. Philomena! Ave Maria Gratia Plena! Through this devotion, we become the slave and possession of this august Queen. It is, therefore, just that we do everything FOR HER, that we work for Her and for Her interests and glory. We do not take Her for our last end, which can be only Jesus Christ, Our God, but for our proximate end, considering Her the most perfect means to go easily and safely to Jesus. “O my dear Mistress, O my Queen, for love of thee, I go here or there; for love of thee, I do this or that; for love of thee, I suffer this pain or that wrong,” etc. Remember, chosen soul, not to approach the Lord except by Mary, that is, through Her intercession, through Her mediation, through the high esteem in which She is held by Him. Do not imagine that it is more perfect to go directly to Jesus, directly to God Himself, in your actions and intentions. If you go to Him without Mary, your actions will be of less value and merit than if you act through Mary, for then it is She who works in you and your actions will be ennobled, and made very pleasing to God. Take great care not to be downcast, should you not enjoy the sweet presence of the Blessed Virgin in your interior! This Grace is not given to all. But, when God in His great mercy favors a soul with this Grace, she can very easily lose it again, unless she be faithful in frequently renewing her interior recollection. Should this happen to you, then immediately return to your heavenly Mother with tranquility of heart and ask Her forgiveness. Experience will teach you a great deal more in this regard than I can tell you and, if you are faithful to the little I have taught, you will find in this practice such treasures of Grace that your heart will be amazed and filled with joy. Let us labor, then, beloved soul. Let us act in such a way that by the faithful practice of this devotion, the soul of Mary may be in us to glorify the Lord and the spirit of Mary, to rejoice in God Our Savior! 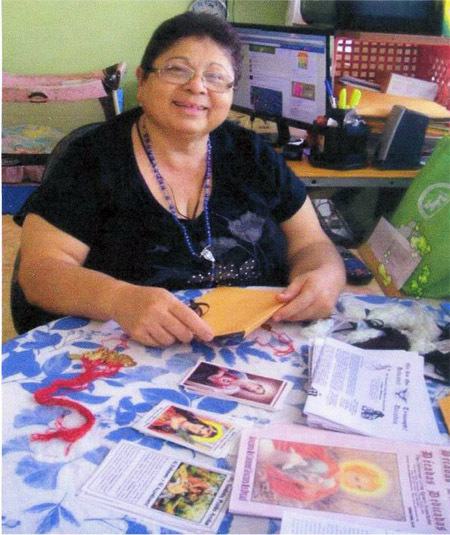 Saint Raphael, Medicine of God!Dear Apostle of the Immaculate Heart of Mary,Thank you for your wonderfully generous donation for our work in mission lands. We hear so much about the suffering of the Church, terrorism, disease and death. God asks us to take an active part in the Redemptive Mission of the Church. The more ‘little’ we become, the greater use He can make of us. Our Blessed Mother will shelter us within her Immaculate Heart and make fruitful our labors. Our prayers are with you. Have Courage! Do we shudder at the thought of suffering and pain? Do we, at times, feel it is impossible to go on? Do we desire a remedy for the ills of this life? We must walk in the footsteps of Jesus, the Model of suffering, in order to find hope and sweetness. We must make this journey with Him. Health and happiness are the two great pillars of life: the body craves health, the soul craves happiness. If we demand happiness from the world, we demand what it cannot give and was never made to give. Though our body may be ill, our soul can be perfectly happy as the source of happiness is God within. Religion enables us to face suffering and even death without fear. We are in this world for a sublime and eternal purpose. Sin is the turning from God to self. It is the only real evil in the world today. It dates back to the Garden of Paradise when Adam first turned from God. With that sin, suffering entered into the world. The crime of our Age is self-love. No small part of the pain and misery in this world can be traced to the sins of mankind. No man loves suffering for its own sake. To suffer like a hero is to learn obedience, patience and charity. It is to follow Christ. Where there is true love, suffering loses its sting. Christ took up His Cross willingly. He loved the Father. He came to earth to do His Will. In doing this, He has conquered death with all its pain. In this lies the victory of every true Christian. The Holy Eucharist contains the Body and Blood, Soul and Divinity of Our Lord Jesus Christ. Christ is our Food! He is the remedy for the ills of the soul. He nourishes our soul, and gives it comfort and strength. With the Bread of Angels, we will face every trial and every form of suffering without complaint and without fear! I remain, one with you in the Immaculate Heart of Mary. 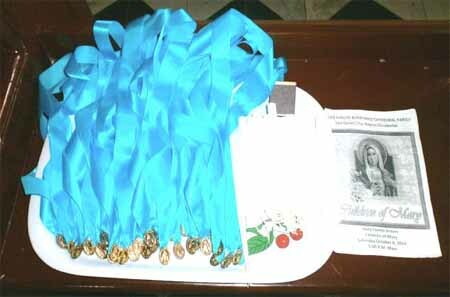 These are the Miraculous Medals given to the Children of Mary during their Investiture. 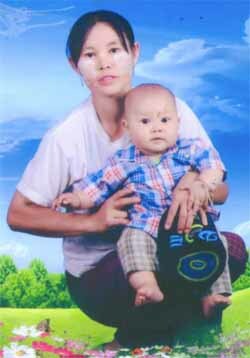 Dear Patti Melvin,Greetings from Kentung, Myanmar!It is my pleasure to inform you that we received all the parcels you sent. We thank you and our benefactors for their contributions and sacrifice. What you sent made a lot of difference in the lives of my parishioners. God really works miracles for those who have faith and trust in Him through the intercession of Mary, Our Mother, and through our beloved St. Philomena. Many sick people have recovered and some ladies, who are married for many years without a child, have now been blessed with children. 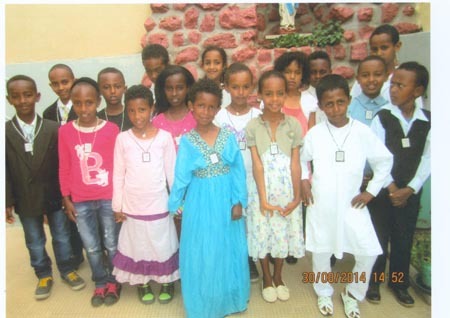 They are healed physically, morally and mentally. 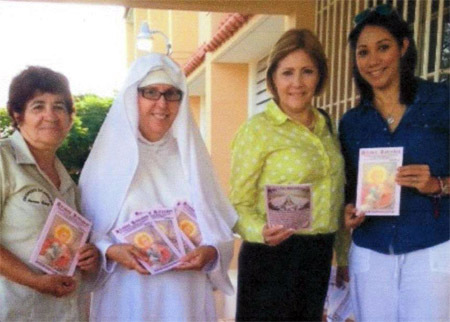 I am pleased to send you the photos, lists of our new members and testimonies of many miracles that occurred in our area. There has been healing and conversions through prayers, Sacramentals and the cord and oil of St. Philomena. I still need many Rosaries, Sacramentals and St. Philomena cord and oil. Thank you and all our benefactors. To perform all our actions in Mary, we must accustom ourselves, little by little, to interior recollection and try to present to ourselves some spiritual image of the Blessed Virgin. This, however, should be done in an easy, natural manner. Mary should be for us an oratory in which we can offer up all our prayers to God without fear of not being heard; She should be the Tower of David, in which we are kept secure from all our enemies; She should be a burning lamp to enlighten our soul and to inflame us with Divine Love. Mary should be the altar upon which we behold God in Her, and Her in God. In a word, Mary should be the only means used by us in dealing with God, our refuge in every need and under all circumstances. When we pray, we should do so in Mary; when we receive Jesus in Holy Communion, we should place Him in Mary, so that He may take His delight in Her. Mary will receive Him lovingly, will enthrone Him honorably, will adore Him profoundly, will love Him perfectly and will render Him such worship in spirit and in truth as is utterly unknown to us in our blindness. Whether the soul is active or quietly abandoning itself to contemplation, it should be done in Mary. Oh, how beautiful is the interior of Mary! Mary is the new terrestrial paradise of the new Adam; the ancient paradise was but a faint figure of Her. There are in this paradise riches, beauties, rarities and indescribable sweetness which Jesus Christ, the new Adam, has left there. For, in this paradise, He took complacence for nine months, worked His wonders and displayed His riches with the munificence of a God. Oh, what glory, what pleasure, what happiness is awaiting those who enter into Mary and dwell in Mary, where the Most High has set up the throne of His supreme glory! But, how difficult it is for sinners like ourselves to obtain the permission, the ability and the necessary light to enter into a place so high and so holy, which is guarded not only by one of the cherubim, like the earthly paradise of old, but by the Holy Spirit Himself, Who is the absolute Master and Protector of the sanctuary of Mary, and Who said of Her: “Mary, My Spouse, is a garden enclosed, a fountain sealed.” The miserable children of Adam and Eve, driven from the earthly paradise, cannot enter into this one except by a particular Grace of the Holy Spirit, which they must first merit. But, after we have obtained this excellent Grace by fidelity in the practice of this holy devotion, we must remain in the fair interior of Mary, repose there in peace, remain there with confidence and hide ourselves therein securely. Thus, in that virginal bosom, the soul will be nourished with the milk of Grace and maternal mercy; it will be delivered from its troubles, fears and scruples; and it will be safe against all its enemies – the world, the devil and sin, which never have found nor ever will find entrance there. Mary, therefore, says that they who work in Her shall not sin. “They who work in me,” (these are the words of Holy Scripture which the Church applies to Mary) “shall not sin;” No! They who truly dwell in Mary’s spirit shall fall into no considerable fault. Lastly, we must remain in the beautiful interior of Mary that the soul may be formed in Jesus Christ, and Jesus Christ in the soul, because Her bosom is, as the Holy Fathers say, the chamber of the Divine Mysteries, where Jesus Christ has been formed and where all the elect are to be formed spiritually. I would like to thank you very much for your support in building the roof of the church. 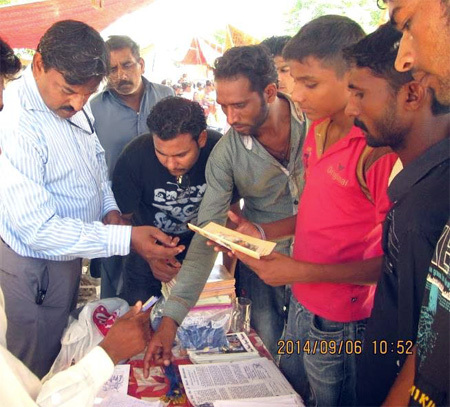 Through your help and support, we were able to buy the iron and steel needed in order to continue the work. This week, the company is going to finish the making of the iron elements for the roof. Next week, they will put them on the roof and then the workers are going to start making the main dome of the church. The church is going to have three domes which symbolize the Holy Trinity. Also, at the present moment, I have the important task to build the main dome and to order four crosses for the church. I am looking for benefactors who can help us build the church and put the crosses atop the main dome and the three smaller domes. The names of the benefactors will be carved on the bottom of the crosses. 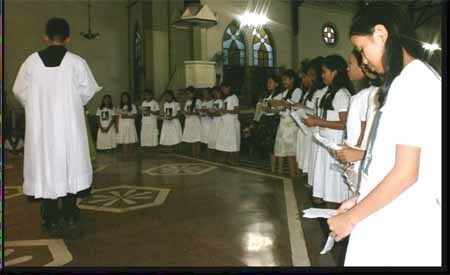 The blessing of these crosses is a very unique liturgical service which is performed by the Bishop. The benefactors who donate for the crosses receive the special blessings and graces. All the people kiss these crosses and the Bishop will be celebrating a special Sacred Mass for the constant protection of the benefactors from every evil. Also, the names of the benefactors will be remembered at the Altar during every Sacred Mass because their names are carved on the bottom of the crosses. The cross is our most powerful protection from the evil; this is why only the Bishop must bless them. Winter is coming and I am trying to put the roof at the church as soon as it is possible. 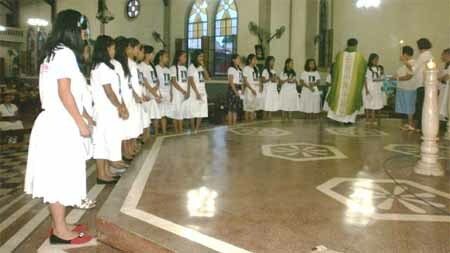 This year, our parish is having 250 children who are going to study Catechism and sing in the parish. 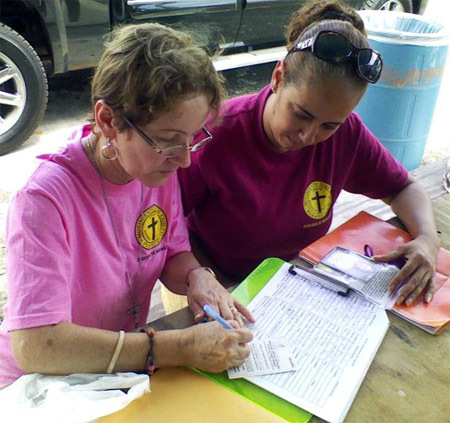 The parishioners help as much as they can but their money is not enough. I beg the good hearted benefactors to help my parish in this noble task. 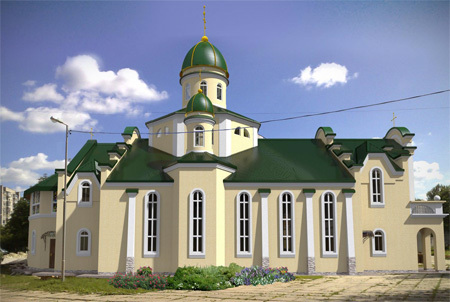 We see here the architect’s sketch of the church upon completion. October is the glorious month of Our Lady of Fatima and the Holy Rosary. We must have a deep appreciation of the Holy Rosary which is the compendium of the Sacred Gospel of Christ. This is a good month in which to consecrate our lives to the Sacred Hearts of Jesus and Mary. We have clear guidelines from the Mother of God, who tells us how to find our way to Heaven: Daily Duty, Reparation, Consecration, Sacrifice and Prayer. Our beloved Mother sets down her wishes so clearly that none can fail to understand them. But, what of the Sacred Heart of Jesus? How best can we live our consecration to Him and in what does it consist? Clearly, in order to model our hearts on the Heart of Christ, we must be a victim of reparation. We cannot limit ourselves to avoiding one fault or another or to acquiring a particular virtue, rather we must strive to reform our whole lives. The Divine Master offered us His Heart as a model, “Learn of Me for I am meek and humble of Heart.” Well He knew, that we must remove all pride and self-love from our hearts. Anger is a symptom of pride. We must master our emotions so that our serenity is not lost. To win this battle, we must never give up the struggle. A very vital part of this effort must be our evening examination of conscience. Do we take time to thank God for the Graces He has given us during the day? Prayer keeps us in the state of Grace. What gratitude do we not owe God for giving us His Divine Son and lavishing on us so many spiritual and temporal Graces! May the Holy Ghost dispel the darkness which hides from us the wickedness and malice of our sins! Let us beg God that we may detest them as much as they are detested by Him, and that we may fear nothing more than to commit them again. We pray that every breath we take and every pulsation of our hearts will offer the Church Militant, Triumphant and Suffering infinite praise, adoration and love unto the end of time. Save us, O Lord, when we are awake, and keep us while we sleep, that we may watch with Christ, and rest in peace. The hearts of all those in Ukraine breath a prayer of thanksgiving for all that you have given to us, for our mighty union of prayer with you, and for making our families and clergy strong in this battle against the enemies of God. All through the month of October, we remember your sick and suffering at the Sacred Altar. A soul is happy, indeed, when it is entirely possessed and ruled by the spirit of Mary: a spirit meek and strong, zealous and prudent, humble and courageous, pure and profound. Happy the soul who in all things is dependent upon the Blessed Virgin Mary and obedient to Her to whom the Child Jesus was subject. Such a one has found true wisdom and the Holy Ghost dwells in him. In order that the soul may let itself be guided by Mary’s spirit, it must renounce its own spirit, its own views and its own will, before doing or undertaking anything. 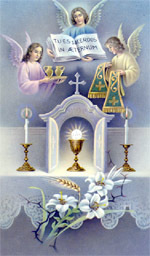 For example, when we pray or hear Mass or receive Holy Communion, we should unite ourselves with our heavenly Mother and, through Her and with Her, receive Holy Communion and assist at Mass; otherwise, our own sentiments, however good they may appear to us, will put an obstacle to the spirit of Mary by the darkness of our spirit and the corruption of our will. Furthermore, we should deliver ourselves to Mary, to be moved and influenced by Her spirit as She chooses. We should place ourselves in Her virginal hands and leave ourselves to Her like a tool in the hand of a workman, or a flute in the hands of a skillful player. We should lose ourselves and abandon ourselves to Her like a stone one throws into the sea. This, however, should be done simply and in an instant by one glance of the mind, by one little movement of the will, or even verbally by saying for example, “O my dearest Mother, I renounce myself. I give myself to thee entirely and through thee to my dear Jesus, with all that I am and have, now and forever.” This is real union of our will and our spirit with Mary, and although we may not feel any sensible sweetness in this act, it is nevertheless real and effective, and will bring forth magnificent fruits if we but remain faithful and do not neglect this easy and loving practice. St. Louis Grignion recommends us to make this act of renunciation of our will and offering to Mary, not only when we begin our work but also during its progress and after its completion. He says, the more we do so, the more we shall be sanctified and the sooner we shall attain to union with Jesus Christ, because the spirit of Mary is the Spirit of Jesus. Dear Mrs. Melvin,First of all, thanks for the airlifts, I got yesterday. I wanted to write to you but I was very tired. I reached Peshawar on October 2, early in the morning. There was no time to take rest. So, after breakfast, I went with Sr, Rozie to her school (St. Michael Convent High School). After a formal welcome, I explained the aim of the ULRA. 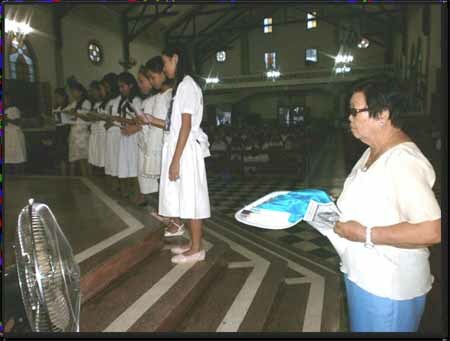 The Rosaries, Scapulars, Miraculous Medals and Decade cards were given to the students after enrollment. Then, along with all these things, books and big pictures were given to teachers also. 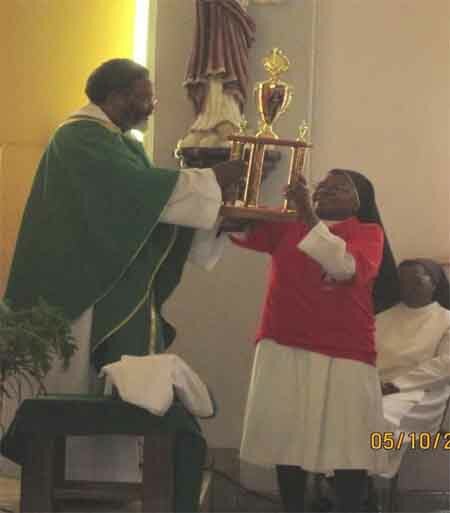 Sister Gulnaz received the statue of St. Philomena on behalf of Sister Rozie. Then, Sister sent me to the Junior campus of St. Michael School. 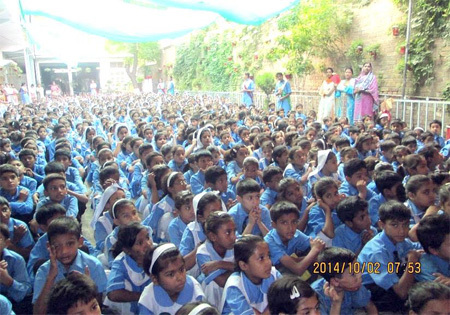 The teachers took the responsibility to teach the students and pray the Daily Decade with them in the school. After giving the devotional items to this school, I was taken to St. John Vianney High School which is run by the Brothers of Charity. 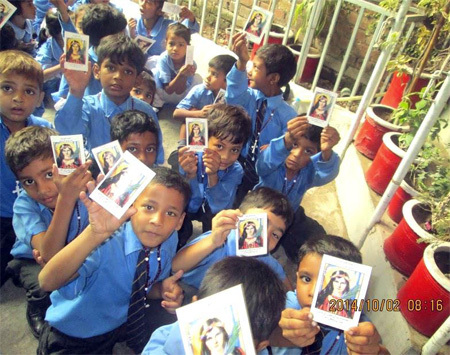 There, I distributed the Sacramentals and the DD cards to the students and teachers. 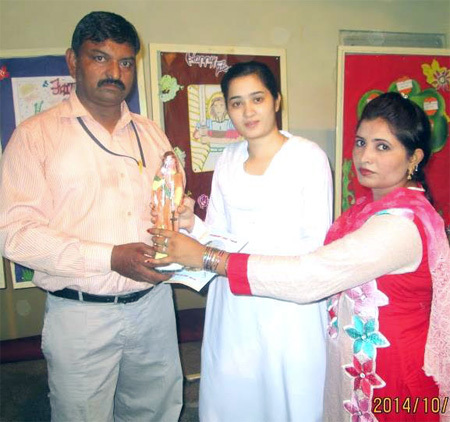 There were some prominent students also who scored excellent marks in religion education. I gave them big pictures. On 3rd, I visited the Presentation Convent High School. I left for Faisalabad at 1 p.m. At 9 p.m. when I reached the bus stop, there was too much rush due to Eid festival. I could hardly get the ticket at 11.15 p.m. but got the bus at 1 a.m. I had back pain due to prolonged standing. I reached home at 7 in the morning. I was feeling very tired, so the whole day I slept. My body was aching but my back was very painful. Now, it is a bit OK. I am leaving for Gojra after few minutes. In the evening, I hope to return home. In spite of all these difficulties, I am happy I could reach out to about 1400 hundred students and their teachers and brought them to Our Lady. God bless you! THANK YOU AND GOD BLESS ALL OF YOU! WE SHOULD PERFORM ALL OUR ACTIONS WITH MARY, THROUGH MARY, IN MARY AND FOR MARY! It is not enough, says St. Louis Grignion de Montfort, to have given ourselves once as slaves to Jesus, through Mary, nor is it sufficient to do so every month or every week. This would be too fleeting a devotion and would not raise the soul to that degree of perfection which it would otherwise be capable of attaining. This very Act of Consecration, if made often and sincerely, is in itself a sublime act of virtue, drawing down upon us the complacency of God and of His Holy Mother. It requires no great effort to practice the outward form of this devotion and say every day a few vocal prayers as prescribed. The great difficulty is to enter into the spirit of this devotion which makes a soul interiorly dependent upon the Blessed Virgin. We enter into the spirit of this devotion when we give ourselves to Mary entirely as Her full possession, and this spirit is nourished within us by performing all our actions with Mary, through Mary, in Mary and for Mary. To perform our actions with Mary, we must regard Her as the accomplished model of every virtue and perfection. She must be, for us, the perfect model which we try to imitate according to our ability and weakness. In every action, we should consider how Mary did it or how She would have done it, had She been in our place. For this end, it is well to meditate on the sublime virtues which She practiced during Her life: First of all, Her lively faith, by which She believed, without hesitation, the Angel’s word and believed it faithfully and constantly up to the foot of the Cross. Secondly, Her profound humility which made Her hide herself, hold Her peace and consider herself the last of all. Thirdly, Her immaculate purity which has never had its equal. In addition to these virtues, our Saint mentions others which we should try to imitate; i.e. Her implicit obedience, Her constant prayer, Her mortification in all things, Her glowing love of God and of neighbor, Her heroic patience, Her heavenly meekness and wisdom. You are currently browsing the Universal Living Rosary Association of Saint Philomena (ULRA) blog archives for November, 2014.